Can Your Son be Named Barnaby if the Dog is Named Barney? Louise is expecting her first child in less a month, a boy. She feels that there isn’t much time left, and she and her husband have not yet managed to settle their baby name dilemma. Their favourite name for a boy, and the one they would very much like to use, is Barnaby. However, they have a pet dog named Barney. Although they aren’t planning to use Barney as a nickname for Barnaby, Louise is realistic enough to know that it isn’t impossible he’ll end up being a Barney, at least sometimes. In any case, she wonders whether Barnaby and Barney are too close in sound, or too closely related to each other. If they decide not to go with Barnaby, their “back up” name is Jasper, which they both like a lot, but they don’t love it the way they love Barnaby. They would definitely feel a pang of regret or disappointment if they didn’t get to use the name Barnaby. Louise wants to know if people think it’s possible for them to use the name Barnaby? Will others think it’s weird if their son and the dog have a similar name? Is it cruel to give their son the same name as the family pooch? The baby’s middle name will be Ross, after his dad, and their surname begins with M and ends with N eg Macklin. Louise, I think most people would cross a baby name off their list if it was the same as, or even very similar to, the name of the family pet. No matter how much they liked it, it would be regretfully banished to the land of Not-to-Be. That you are still seriously considering the name Barnaby, and in fact it is still your front-runner, tells me you are extremely attached to it. If you are still considering the name Barnaby, then I would say, yes it is a real possibility. Will other people think it is weird? Quite likely some of them will. Are you obligated to fulfil the expectations of others in your choice of baby name? No. The most important thing is whether you think it is weird or not. (If you are writing in for opinions, and have a “back up” name, then at least part of you must think it’s a little weird). 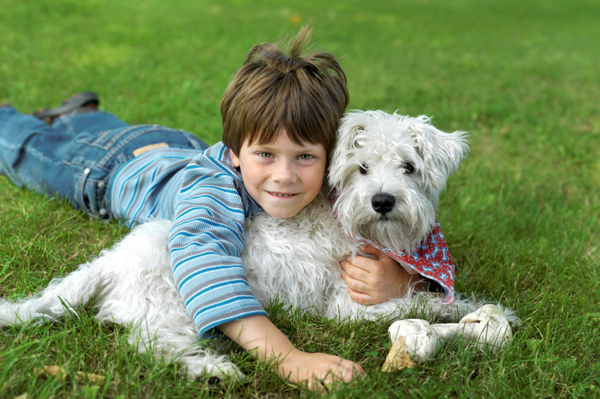 I don’t think that it’s a great idea for your son and your dog to share very similar names, but being practical, these things are often more of a big deal in our heads before they happen than they are in real life. It’s not ideal, but it may be workable. I think the biggest mistake you are making is thinking that you are running out of time, and need to make a decision before your son is born. Please consider taking your new baby home before choosing the name – once you have your son in the same house with the dog, using both their names, you will have a real life situation in which to make a decision, rather than a theoretical one. I suspect that either you will find that it is actually a bit too weird and just isn’t going to work, or else that it feels more easy and natural than you feared. Although if you stick with Barnaby, I would be prepared to laugh off a few jokes from friends and family about your choice. Please write back and let us know what you decide! NAME UPDATE: The baby’s name is Archer! POLL RESULTS: Almost 85% of respondents thought that the name Barnaby was acceptable for a couple who owned a dog named Barney. 44% thought it would be unusual, but would work out fine, 28% didn’t like the idea, but thought that it would probably be okay, while a relaxed 12% couldn’t even see what the problem was. Only 4% of people thought that it would be very wrong to name your son Barnaby if the dog was named Barney. More than half of respondents preferred Jasper Ross to Barnaby Ross, with 55% choosing the first option and 38% picking the second. 7% of people couldn’t decide as they liked both names equally. As a massive dog lover, please don’t take this comment to mean I am unfeeling towards Barney. BUT, dog’s don’t live forever. I don’t know how old Barney is, but let’s say he lives a maximum of 10 more years. Yes, ok, it may seem weird at first but as a grown man, Barney the dog is not going to factor into the equation when it comes to Barnaby’s name. And worst case scenario, you just explain that Barnaby named Barney himself! If so, striking it off your list is the wrong thing to do. Hey, if Steve Irwin could name his daughter after his favourite crocodile, I think it’s fine that your son has a similar name to your dog. It’s not an issue. Same suggestion, change the dogs name. We were thinking of doing that – we liked the name Harrison but already had Harry the dog. Mum suggested to change the dogs name to Barry, lol! Ended up falling in love with a different name anyway but I still think the suggestion has merit. Barney the dog could become Marnie? Yeah, I was thinking Arnie for the dog. If it were me I would not be able to resist pretending that had been the dog’s name all along, and having a silent giggle at everyone trying to work out if they had been hearing the dog’s name wrong for years. I think Barney and Barnaby could be tough, but Arnie and Barnaby is fine. Change the pooch’s name and name the baby your favourite name. I didn’t want to suggest changing the dog’s name as this isn’t a dog advice blog, but from what I’ve read online, changing a dog’s name is actually very easy (animals don’t seem to be that attached to their names), so this probably is a genuine option.